Come on, just for a second you thought I was about to break out with tips on preparing your bird. 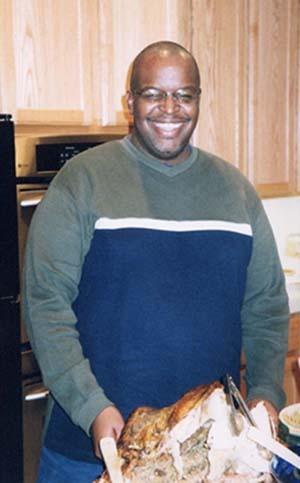 I have only had the pleasure of cooking a turkey once and this one was not it. However, I did well on my first attempt. Now this baby here is my own handiwork. 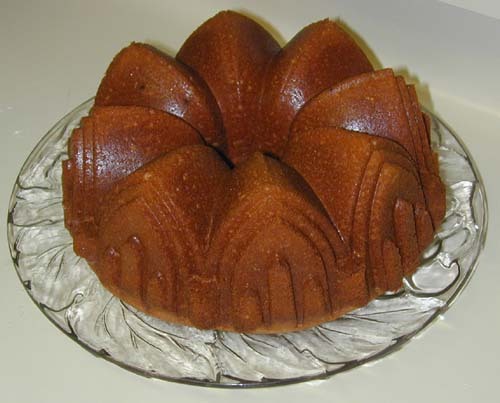 It is an egg nog rum cake made in a cathedral bundt pan. Quite impressive if I say so myself. All it needs is a little powdered sugar or a lethal rum glaze to put it over the top. I am taking this cake to Chicago later today for dinner. My mommy will be quite proud. Sending you much love and many blessings for a Happy Thanksgiving!!! This entry was posted on Thursday, November 27th, 2003 at 12:15 am. It is filed under Random Thoughts and tagged with Happy Thanksgiving!. You can follow any responses to this entry through the RSS 2.0 feed. Bravo! THat cake is oh.So. Beautiful. Almost (I said almost)makes you not want to eat something so lovely. I do believe one of those pans is in my future. Once again, a blessed holiday to you. James , you are truly multi-talented. I forget that you do so many things great…just don’t forget to save me a piece of cake. I want cookies for Xmas. Your sweet potatoe pie is waiting for you. beautiful cake… wow. Happy Thanksgiving to you also!!!!! Thanks for all the great reviews that you have provided during the past year. As a struggling musician, I deeply appreciate knowing that there is always someone out there who has an open ear. In keeping with the nature of this website, don’t you think you should have made a cake in the shape of a piano, or a tenor sax, maybe Regina Carter’s violin? wow… that cake looks amazing! i’ll bet it tasted amazing too! hope you had a happy holiday! Great photos, James. That cake looks exquisite!! I’m quite impressed. Hope you had a safe trip home. now see.. ya gonna make me go out and buy a new baking pan… you always find a way to make me wanna spend some money… hahahha. I guess I’m one of the lucky ones… I’ve had the chance to sample your cooking… and go back for seconds… ok thirds… and get some to take home. Um… I seem to recall asking for the recipe for this cake sir. Death to my old bundt pan. I’m getting a new one today! …and I believe I still have that recipe you posted, too. My diet doesn’t stand a chance, and I’m blaming it all on YOU! Hope you had a GRAND Thanksgiving!!! Hey handsome. That cake looks awesome. Hope you had fun and good eating with your family. That 7-Up cake looks great!. When will you add a track or two to more of your reviews?